Cutaneous melanoma is the cancer with the steepest increase in incidence in the Caucasian population (1) and is currently the most common cancer among young adults (2). Mortality rates are increasing correspondingly, and the disease still leads to death in one of every four to five patients. Ultraviolet light exposure has been identified as the main exogenous risk factor. A highly pigmented skin type protects from the deleterious effects of ultraviolet irradiation and is associated, consequently, with a lower risk. 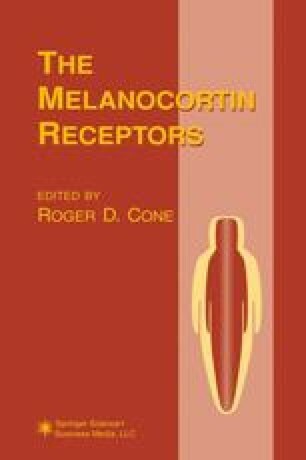 As the melanocortins are well-known stimulators of melanogenesis not only in melanocytes but also in melanoma cells, the question arises as to whether these peptides have a protective function or represent an additional risk factor for melanoma development. Experimental investigations in vivo were initiated by Lee et al. (3) who were the first to demonstrate that daily injections of α-melanocyte-stimulating hormone (α-MSH) into B16 tumor-bearing mice not only induced a marked increase in tyrosinase activity and melanogenesis of the tumors but also had a tendency to retard proliferation of the tumors. This growth retardation was shown to be negatively correlated with the metastatic potential of the cells (4): B16-F1 cells (→low metastatic potential) were more affected by α-MSH than B16-F5 cells (→intermediate metastatic potential). The growth of B16-F10 cells (→high metastatic potential) was not affected by α-MSH, although the number of MSH receptors did not differ significantly between F1 and F10 cells (5). This indicates that the response of melanoma cells to melanocortin peptides is complex and not simply a question of MSH receptor numbers expressed on the cell surface. This chapter reviews the literature of the past ten years by addressing the following topics: the functional effects of MSH peptides on melanogenesis and intracellular signaling in melanoma cells as well as on cell proliferation and metastasis; the regulation of MSH (melanocortin 1 [MC1]) receptor expression on melanoma cells; the role of ectopically produced proopiomelanocortin (POMC) peptides, and finally the potential application of MSH peptides to tumor targeting and therapy. The literature published before 1988 was extensively covered in an earlier review (5).